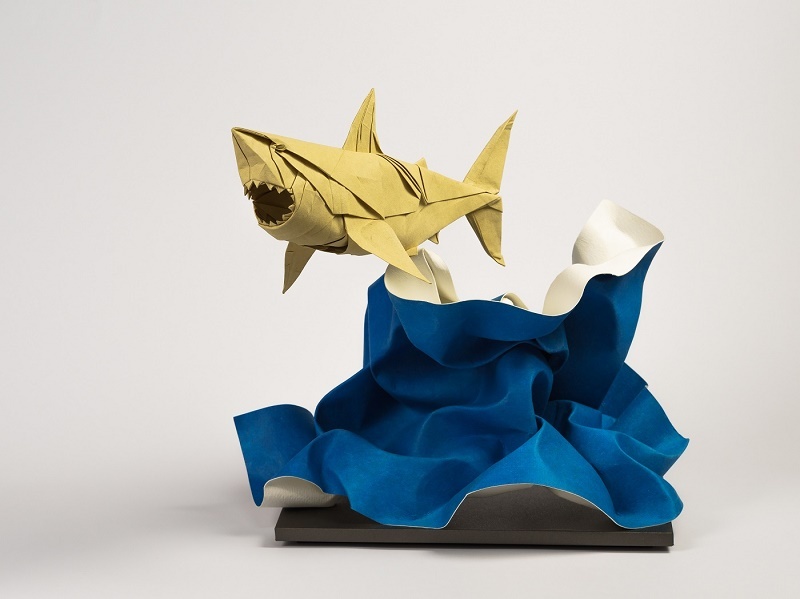 Nguyen Hung Cuong's "Great White Shark" can be seen in Science Museum Oklahoma's smART Space galleries starting March 9. The exhibition explores the diverse styles, backgrounds and techniques of 30 origami artists from around Oklahoma, the nation and the world as well as the unique applications for the art form — from solving problems in the fields of robotics, medicine and space exploration to uses in fashion and architecture. The Art and Science of Origami." “We are honored to showcase the work of some of the foremost origami artists in the world here in Oklahoma City — artists like physicist Robert Lang, wildlife biologist Bernie Peyton, MIT faculty Erik and Martin Demaine, and professional artist Paul Jackson are doing almost unimaginable things with single sheets of paper, and beyond that, have had extraordinary influences in the application of origami to the sciences,” said Scott Henderson, director of SMO’s smART Space galleries. “Over the last 30 years, origami has evolved from traditional shapes into advanced geometric forms through the use of analytical geometry, linear algebra, calculus and graph theory, and the applications are amazing. Principles of origami are being used by NASA for space exploration, in research labs to fight cancer, in manufacturing to make solar panels more efficient and to make air bags safer — and the list goes on,” Henderson added. Guests will not only take in more than a hundred origami pieces and learn about how origami is used in science, but can also try their hands at creating their own unique shapes in the exhibit’s hands-on space. “Into the Fold: The Art and Science of Origami” is open through Jan. 13, 2019, and is included with general admission. Artists featured in the exhibition and their city or country of residence are Zephyr Andrews, Oklahoma City; Viviane Berty, France; Kevin Box, Santa Fe, New Mexico; Joel Cooper, Lawrence, Kansas; Nguyen Hung Cuong, Vietnam; Erik Demaine, Cambridge, Massachusetts; Martin Demaine, Cambridge, Massachusetts; Lea Freni, New York; Rebecca Gieseking, Evanston, Illinois; Eric Gjerde, Minneapolis, Minnesota and London; Miri Golan, Israel; Sarah Hou, Grinnell, Iowa; Paul Jackson, Israel; Beth Johnson, Ann Arbor, Michigan; Robert J. Lang, Alamo, California; William Larason, Oklahoma City; Byriah Loper, Lexington, Kentucky; Jun Mitani, Japan; Tuan Tu Nguyen, Vietnam; Uyen Nguyen, New York; Benjamin Parker, Manchester, Connecticut; Bernie Peyton, Berkeley, California; Uyen Nguyen Ngoc Phuong, Australia; Larry Pickering, Oklahoma City; Adrienne Sack, New York; Klint Schor, Oklahoma City; Ioana Stoian, Minneapolis, Minnesota and London; Jule Waibel, Germany; Hiroki Yoshihara, Japan; and Jianlan You, Norman, Oklahoma.